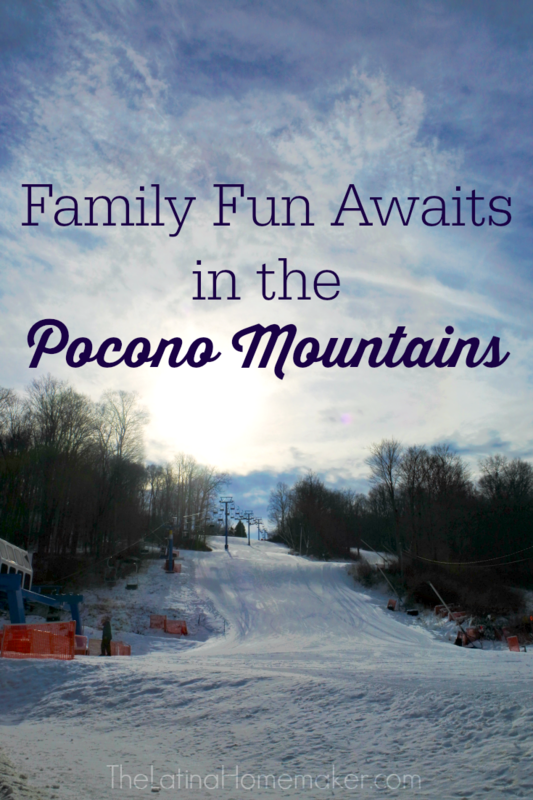 Find out why you should add the Pocono Mountains to your family’s must-visit list! Special thanks to the Pocono Mountains Visitors Bureau for hosting our family and helping facilitate my review. All photos, fun and opinions, are 100% my own. Last month our family took a quick road trip to visit the Pocono Mountains. We’ve been visiting the area for several years now and we look forward to it every single time. The Pocono Mountains is just a quick drive from Central Pennsylvania and it’s a great place to escape from the daily hustle and bustle. The Pocono Mountains offers a variety of accommodations to suit your family’s needs and budget. From historic inns to waterpark resorts, you’re sure to find a home away from home. During our visit we stayed at The Shawnee Inn and Camelback Resort. I loved that both locations offered something unique to their guests. If you want to watch a quick video recap of our trip, check out the video below! At The Shawnee Inn, we were treated to a hayride tour that ended with a bonfire and s’mores. 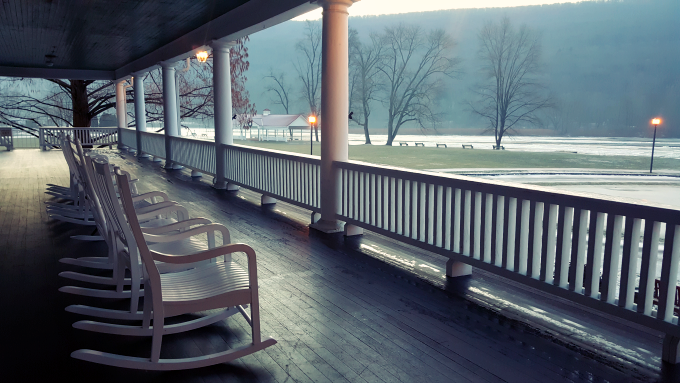 Just steps away from the Delaware River, this historic inn offers scenic mountain views and a charming atmosphere that new hotels can’t replicate. The inn is a great place to unwind and enjoy nature’s best. Doesn’t this porch make you want to sit with a hot cup of coffee and just take in the views? Camelback Resort is a modern lodge that prides itself in their year-round amenities and attractions. You’ll have access to several dining options, shopping, indoor entertainment and spa. My kids had a blast exploring the resort’s waterpark, Aquatopia. 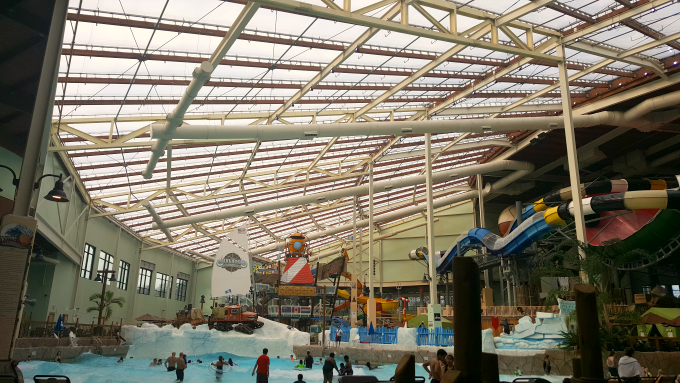 Currently the biggest indoor waterpark in the Northeast. If waterparks are not your thing, the Pocono Mountains has you covered. Staying at The Shawnee Inn? You’ll only be three miles from Shawnee Mountain where you can ski, snowboard or snow tube your heart out. The boys tried the snowboarding classes while the little one enjoyed the children’s ski program. She was a bit reserved at first, but she eventually warmed up to her wonderful instructor and had a blast. If you’re staying at Camelback Resort, I recommend checking out Camelback Mountain. We were able to take a shuttle from the resort to the mountain which was super convenient. 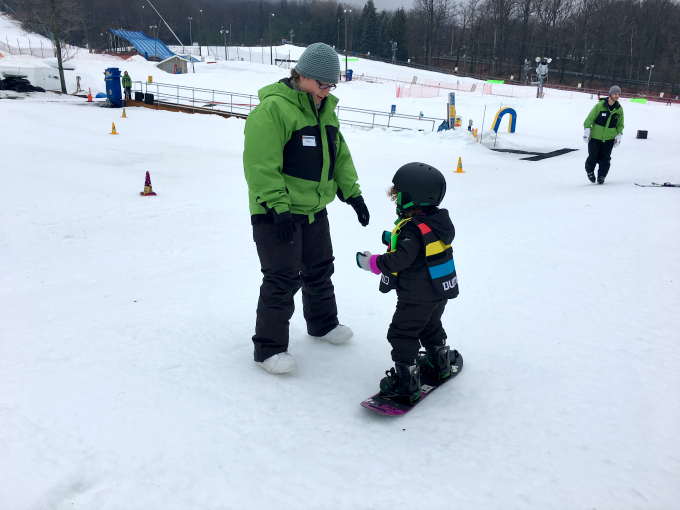 Camelback Mountain offers a wide range of options including Ski & Snowboard programs for children and adults. My husband tried out the ski lessons and even skied down the bunny hill a few times which is big deal for a non-skier like him. 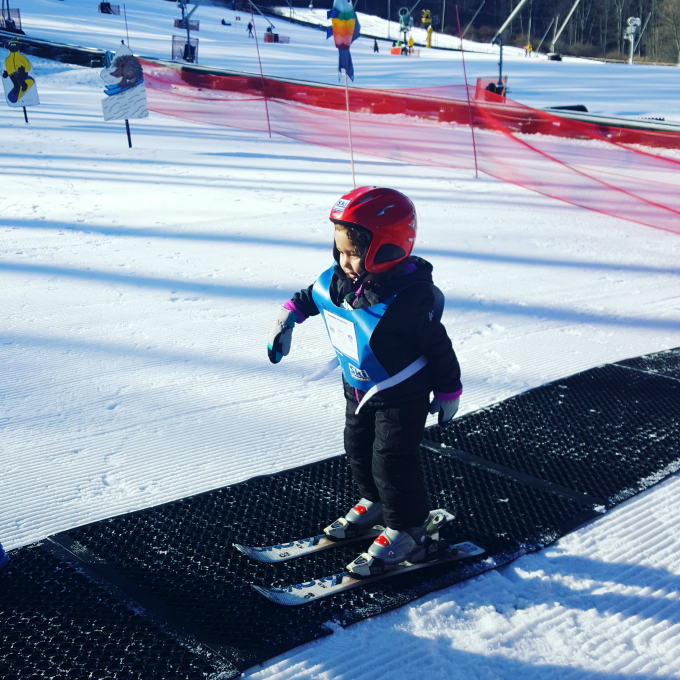 My preschooler wanted to try out snowboarding instead and also did incredibly well. Another highlight from our trip, was snow tubing in the dark at Camelback Resort. 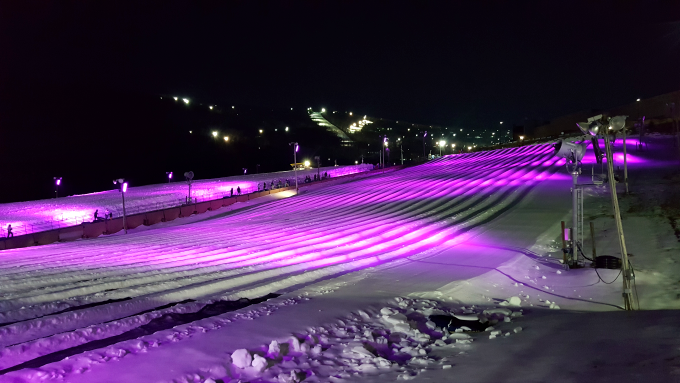 Galactic Snowtubing is just a quick shuttle away for Camelback Resort guests. My kids enjoyed the lift that took us to the top of the hill as much as the ride down. If you need a quick break to fuel up or warm up with hot chocolate, check out the Basecamp Lodge. You know I couldn’t possibly tell you about our trip without mentioning food. The Gem and Keystone it’s steps away from The Shawnee Inn and offers a variety of pub items, salads, and entrees in a casual atmosphere. 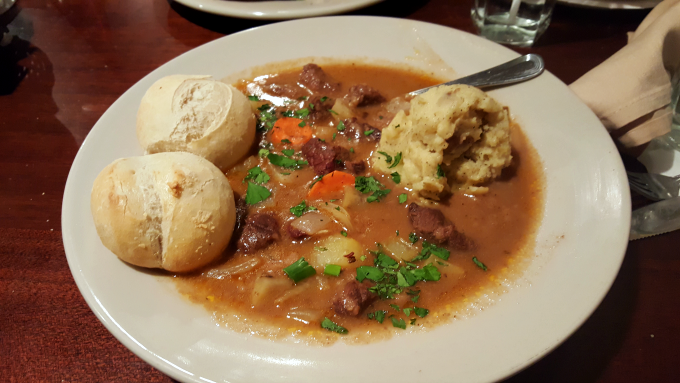 I was in the mood for comfort food, so I ordered the pot roast and mashed potatoes. It didn’t disappoint. During our visit, we also made a stop at the Barley Creek Brewing Company to grab lunch. 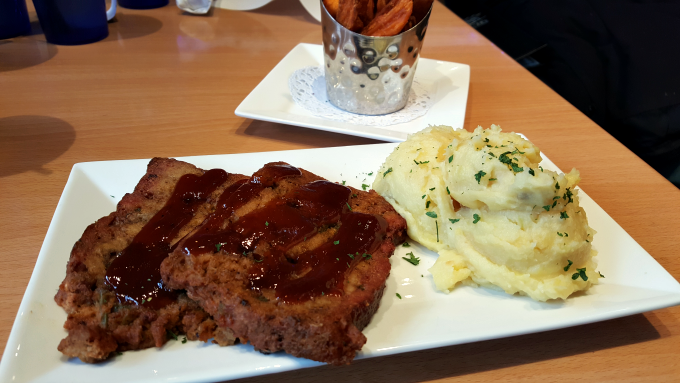 I had the smoked meatloaf with mashed potatoes. The meatloaf is smoked 8 hours in a Meadow Creek smoker and brushed with BBQ sauce. Sooo delicious and definitely a must try! Make sure to take advantage of the free brewery tour that’s offered daily. If you enjoy food with an international flair, I recommend El Rincon Caribe which is a short drive from Camelback Resort. This tiny place offers authentic Caribbean food that reminded me of home. Have you ever visited the Pocono Mountains? What are some of your must sees? I’d love to hear from you!